In Anne Arundel County, storm drainage systems collect stormwater runoff and carry it, untreated, to the nearest waterway or Best Management Practice (BMP). In urban areas, the storm drainage system consists of drains and underground pipes. Storm drains are normally located in streets and parking lots. In rural areas the storm drainage system may be in the form of ditches that carry the stormwater along a roadside or piece of property. These drainage systems are meant to carry only unpolluted stormwater. Putting oil, antifreeze, detergents, and other material into the storm drainage system is the same as dumping them directly into a stream or river. The sanitary sewer system is different. Sanitary sewer drains lead to the sanitary sewer system and end up at a wastewater treatment plant. This system carries household wastewater and some permitted industrial wastewater. The wastewater in this system is treated before being discharged into a natural water body. In Anne Arundel County, the storm drain systems are not connected to the sanitary sewer system. 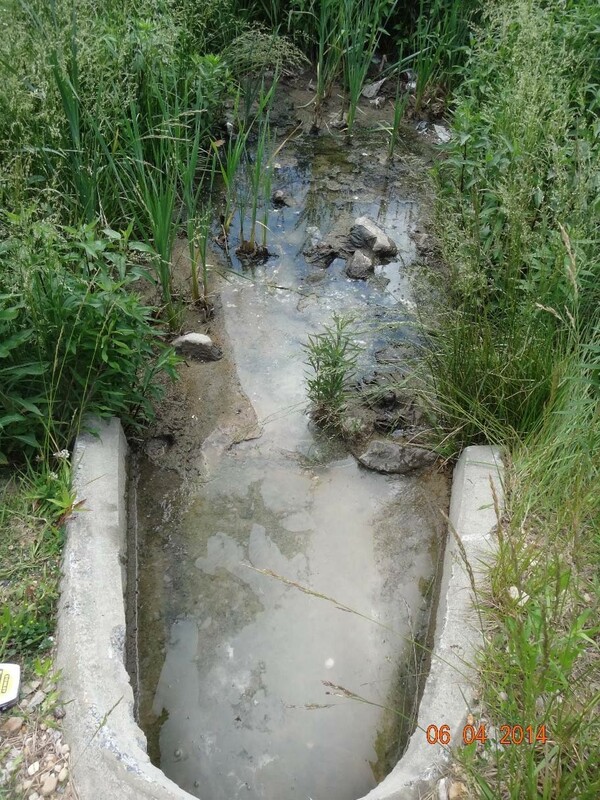 An illicit discharge is the discharge of pollutants or non-stormwater materials into the storm sewer system via overland flow, direct dumping, or illicit connections. Illicit connections are pipes or other direct connections that illegally or unknowingly release pollutants or non-storm water materials into a storm sewer system or directly into a body of water. How does Anne Arundel County detect illicit discharges? - Reporting of all discharge detection and elimination activities. The County’s IDDE program uses outfall field screening to locate illegal storm drain connections or other non-permitted dry-weather discharges through the municipal storm sewer systems. Where dry-weather effluent from municipal storm sewer systems is found, it is tested for contaminants. If contamination is found, the program requires that it be eliminated or permitted. Within each area where illicit screening is performed, routine visual surveys are conducted of commercial and industrial drainage areas. Inspectors drive through each commercial and industrial area, visually screening the area for signs of pollution sources. If pollutant sources are present, the site is flagged for further review by the County for possible enforcement action. The Anne Arundel County Department of Inspections and Permits (I&P) maintains an inspection and enforcement program for the discharge of non-natural stormwater into the County storm drain system, which includes illicit dumping and spills. This program is primarily complaint-based with complaints filed by the public, other County inspectors, or other County departments. In the event of dumping, a spill, or an illegal connection, I&P has the authority to issue a correction notice or, in certain cases, refer the matter to MDE for further review and corrective action. What kinds of non-stormwater discharges are allowed into the storm drain system? - Discharges from fire fighting activities. - Discharges from potable water sources not containing chlorine, including dechlorinated water line and fire hydrant flushing. - Discharges from air conditioning condensate. - Discharges from water from individual residential car washing. - Discharges of uncontaminated water from basement or crawl space sump pumps. - Discharges of uncontaminated water from foundation or footing drains. - Discharges from lawn watering. - Discharges from uncontaminated groundwater. How do I report an illicit discharge or other stormwater pollution issue? Illicit discharges cause water pollution by sending pollutants right into our streams, creeks and rivers. To report an illicit discharge, spill, or other environmental violation, call the Anne Arundel County Environmental Hotline at 410-222-7171. In case of emergencies, call 911. What can you do to stop the pollution of stormwater? Many of our daily activities have the potential to cause stormwater pollution. How you manage your day to day activities and property can determine the quality of our local waterways. Here’s how you can help prevent stormwater pollution around your home. Routine business activities may negatively impact stormwater due to leaks from equipment and stored materials, improper cleaning practices and over-application of chemicals. It's important that businesses develop "Best Management Practices" to ensure that employees are aware of the proper way to handle and dispose of materials that could have a negative effect on the natural environment. Many industrial businesses are required by the Maryland Department of the Environment to have a Stormwater Pollution Prevention Plan (SWPPP). A SWPPP is a written document that identifies the industrial activities conducted at the site, including any structural control practices, which the industrial facility operator will implement to prevent pollutants from making their way into stormwater runoff. The SWPPP also must include descriptions of other relevant information, such as the physical features of the facility, and procedures for spill prevention, conducting inspections, and training of employees. The SWPPP is intended to be a “living” document, updated as necessary, such that when industrial activities or stormwater control practices are modified or replaced, the SWPPP is similarly revised to reflect these changes.